So far this endeavor has enriched my life quite a bit. I'm doing more interesting and fun things so that I don't have boring photos. I try to pick my photo of the day to be something that represents that day, or something of significance to my life. I try to include people in my life in my photos. This is a personal choice, but to me, more people photos generate more fond memories for me. I keep thinking how awesome Dec 31st is going to be, when I have a year in my life documented with photos and words. It is something bewildering and humbling to me. I wear makeup more often now. The vain side of me doesn't want to be caught all the time on the camera without makeup. But I also have bare-faced photos of myself (all my running photos, for instance), because I'm also keepin' it real! Both are good. The friends I've made on the internet who share this journey with me is part of the reason why I stick with it. I love looking at your photos too. What are your thoughts on Project 365 now that you've done it for over two months? Has it enriched your life in unexpected ways? What are you going to do with all your photos at the end of the year? Feel free to comment because I'm curious to know what kind of impact P365 has had on your life so far. Lol ^. 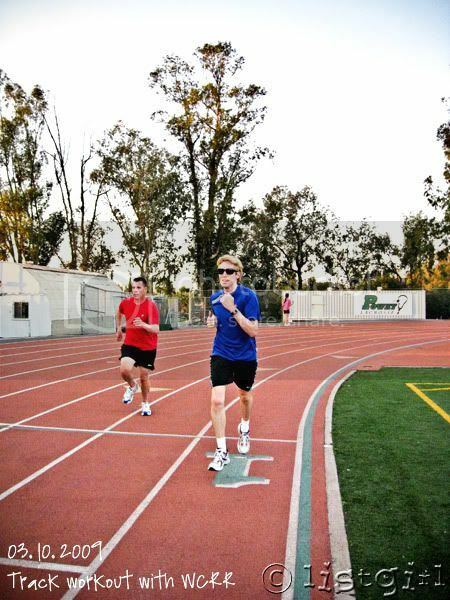 :) Great pic, it is so fun to see your commitment into your running. About the p365: It has definitely forced me to look at my everyday life, to see the small things that matters to me, and to think about how I appreciate my family and friends (and pets :). It has also learned me a lot about other people living in other countries. To see these snippets out of their life, and read their stories, gives me great value. Thank you, Christine, and everyone else who shares their life! I agree with Erikas comment! I actually am not doing the Project 365, but seeing everyone else do it has completely inspired me to do it next year. I was thinking yesterday what a great concept it is and how neat it would be to have that record. Thanks for sharing yours with all of us! That Todd's so funny! I love your photos!! Which track do you guys workout at? It doesn't look like Balboa Stadium, and I've been looking for a track closer to home to do my repeats. I like my photos to represent the day, too. My goal is to do more interesting things so that I can get more interesting photos. Doesn't always work out for me, though! LOL! I've been burned out a little...just because it's hard to keep finding photos to represent a day that was pretty much like the day before (my life isn't like that, but in photos it sure looks that way). Anyway, now that Spring is here, I'm thinking things will pick up. Reading your thoughts has given me new motivation, too! Thanks so much for sharing!